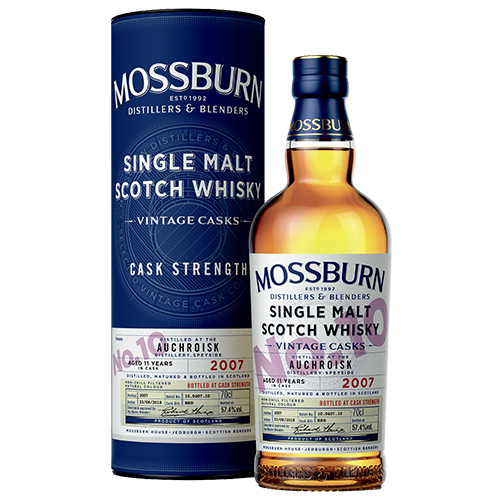 The Mossburn Vintage Casks range are a collection of Single Malt Scotch Whiskies each issuing from a strictly limited and select batch of casks. Each numbered release will only ever yield a finite number of bottles. While this means that we can never replicate the particular character of this Single Malt, it also offers an opportunity to sample what we believe to be an exceptional example of the whisky made by one of Scotland’s most distinguished distilleries. A modern distillery close to the River Spey. Here the eight ‘lampglass’ shaped stills produce a characterful spirit which lightens with age. We have aged this whisky for eleven years in refill Hogsheads to allow the distilleries essence to shine through. There is a light grassy citrus nose that deepens to make way for some oak and crème caramel. The palate has developed to include some nuttiness with touches of black pepper and golden syrup.